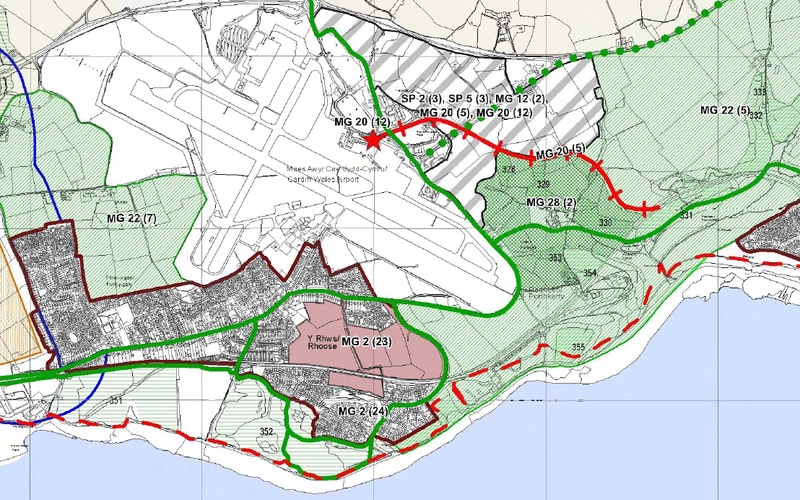 Vale of Glamorgan Council are proposing a new rail spur from the Vale line to Cardiff airport – the route is in the main picture above, marked by a solid red line. This spur will limit how many trains can run on the Vale of Glamorgan line between Cardiff and Rhoose/Llantwit Major. With additional trains diverted to the airport – how frequently will your community be served? The cost is potentially huge. The Local Development Plan says that it will be paid for by a private company and the Welsh Government (us, the taxpayers). But is it really worth it? Can Wales really afford this big project? The addition of this direct rail link will NOT solve Cardiff Airport’s problems. The problem for Cardiff Airport is the lack of air routes, not the lack of a rail line. The proposed rail link will go through ancient woodlands with their precious badger, bird and bat habitats. The rail link is unnecessary, expensive, damages public transport to Rhoose and Llantwit Major and local wildlife. We are going to look deeper into each of these issues and report back as soon as possible. This entry was posted in Misc and tagged Cardiff Airport by admin. Bookmark the permalink.